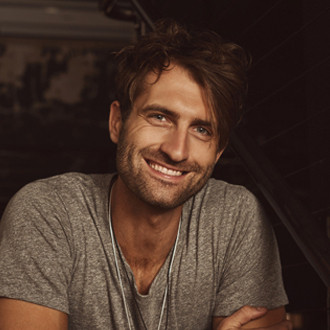 Singer/songwriter Ryan Hurd celebrated a special day recently with Luke Bryan’s hit, “Sunrise, Sunburn, Sunset.” It was the Kalamazoo, Michigan native’s second number one hit on the Billboard Country Airplay chart. Three years ago he toasted a #1 tune with the Grammy and CMA-nominated duet, “Lonely Tonight” for Blake Shelton & Ashley Monroe. We are pleased to present this new Q&A interview with Ryan Hurd. He talks about the story behind his two #1s, his working relationship with star artist and wife Maren Morris, and why it’s not so hard to give away a hit to another artist. BC: Congratulations on your second #1 single as a songwriter. Can you tell me about the story behind “Sunrise, Sunburn, Sunset” (written with Chase McGrill & Zach Crowell)? Ryan Hurd: I have written with Chase McGill for a handful of years. We knew each other before we each signed with Universal (Music Publishing). Since I’ve done a lot more artist work the last year, I haven’t been writing as frequently, but my publisher, Cyndi Forman (VP of Creative at Universal), called me one morning about 9 o’clock and said, “What are you doing today? You want to go write with Chase?” So, on short notice I went and wrote this song and found out later that Tyler Hubbard (of Florida Georgia Line) had actually cancelled on this day. I remember the song not being like a quick [write], but I remember it being a fun song to write. I got to play with melodies on synthesizers, and I remember writing the second half of the second verse and feeling like this is a really great song. I think my favorite part about it, is all those pictures in my mind of this lake house that I grew up on in west Michigan. That imagery is a real place to me. There’s a lot of stuff that happened really quickly to get it on Luke’s radar, but the whole process of creating the song was really enjoyable. BC: Your first #1 hit was “Lonely Tonight,” the duet for Blake Shelton & Ashley Monroe of Pistol Annies. How did that song develop? Hurd: I remember writing the song on acoustic guitar with Brent Anderson, who is an incredible Nashville songwriter. That song originally wasn’t intended to be a duet, but it had this echo part that we had written. When we were making the demo, we made a snap decision to add the female part to it. was co-written by Ryan Hurd. There is a really specific way that Scott Hendricks, my producer, wants you to pitch him songs. This song got to him through his email, which is specifically not the way he asks for it. It kind of reinforced the fact that Blake was the perfect artist to have that song. To have those two guys have songs that are a piece of their careers is a really special thing. BC: How did you get started in songwriting? Hurd: I’ve always been around music. My mother plays piano, and my dad’s always sung in church. When I went to college in Nashville, I got a sociology degree and wanted to go do graduate school somewhere. When I got out of college, I was in Nashville. I decided I wanted to give songwriting a chance, and I wrote a couple of songs by myself and then found a really cool group of writers that were just starting out in the same spot I was in. We kind of marketed ourselves as a songwriters group and wrote a bunch of songs together. Eventually, each one of us got publishing deals at a similar time, and then we had our first cut together and started having our first singles on the radio together. We did our own writers round once a month in Nashville. It was really fun. Looking back on it now, it’s really fun to see the same people I started with are the same people I’m writing songs with today. BC: How long have you been writing songs, and how have you seen yourself grow as a songwriter? Hurd: I signed my first deal with Universal in 2012. I wrote for two years before that to try to get my foot in the door. That’s as long as I’ve been writing country music seriously. I feel like I’ve really done a good job since I decided that this is what I wanted to do. I really focused on what I did on Music Row and doing everything I could to be a part of that community. I’ve done every little step right in front of me, in order to get to the point of having a catalog that has cuts with a bunch of major artists in country music, and also to be able to have my own artist project that we’re still building right now. BC: Do you regret giving away some of those songs that you wrote for other artists that became bog hits for them? Hurd: Anytime somebody in Nashville records your song, it’s such a huge honor because they could potentially sing that song the rest of their career. I don’t ever take that lightly. Second of all, these artists can do way more than I could do with them at the time. Also, I think “Sunrise…” was a massive hit no matter what. If I were to try to put it out, I think that would have been a hit for me, [although] not the same way it was for Luke. wrote as a wedding gift for his wife, Maren Morris. BC: What do you see as your greatest strength as a songwriter? Hurd: I think having my own unique phrasing as far as the way you say words and the way you create melodies is really important. I think my phrasing…has made me a unique writer and artist. I think lyrically I bring a lot to the table. I find myself, when I’m in a co-write, acting as the artist in the room, where I’m almost creating the phrasing, the lyrical content while everybody else is shaping the other things in the room like the melodies and a lot of the production stuff. BC: You’ve done well as a songwriter and are starting to kick off a career as an artist. Was being an artist your dream all along, or an extension of it? Hurd: It’s so funny that it’s distinguished that way because I think the art is in the creation of the song. I always set out to be a writer, and I wanted to do that. That’s all I’ve ever wanted to be. When I first started doing this, people would ask me that question all the time. I turned down a lot of label interest. I was saying I just wanted to be a writer, and people believed me. Then, I said, you know what? I think I should definitely explore this, and I started making my own recordings. It took a second for people to really believe me. I did not set out to make my records. It’s been really cool. I look at being a writer and artist as like the same set of shoes, the right foot and the left. I can’t imagine doing one without the other. I feel like they kind of complement themselves in such a great way. Since I’ve been chasing down my own project, so many more doors have opened for me with other artists who are interested in touring or interested in co-writing with them now because they like something I’ve put out. It’s been cool to do both, and I hope I get to do that forever. BC: You’ve toured with your wife, Maren Morris. What’s it like for a husband and wife to work together on the road? Do you write songs together too? Hurd: We met each other writing songs. I met Maren in the writer’s room, and we wrote a song for Tim McGraw that was her first cut as a songwriter. She moved to Nashville to do the same thing as me. She just wanted to write songs, and the artist part was undeniable at some point for her. I had written for her album and her new album too, and she’s written for mine. We sing together a lot. It’s really complementary…it doesn’t feel like work. I’m actually out on the road with her right now for the weekend. It’s like home for us. It really has been cool to get to tour and write with her. It’s what we talk about when we’re at home. I really love when I get the opportunity to either write or sing with her. BC: It could be like the next Tim McGraw/Faith Hill kind of thing. Monroe), which was co-written by Ryan Hurd. Hurd: That would be really fun someday, but I really do love supporting her, and she’s been so supportive of me. We’ve been having a really fun life and relationship. It feels like I get to do her career the same way she gets to do mine. It’s been a really special thing. BC: Can you talk about the debut album you’re working on? Hurd: I inject a lot of my own emotional energy into all of the songs that I put out as an artist. I’m really excited to have people to hear a lot more from me. Anytime you get to release a song it’s really cool, and it’s really special. [But] when you release an album, you get to put a whole lot more of yourself into what people hear. We’re still working on what songs are actually going to be on it, and what the strength of it’s going to be. But I’m real excited because it’s so cool to get to make music in Nashville and to get the songs out to country radio. I’m really excited for people who kind of discovered me to get a whole book instead of just a chapter from me.